Well here we are in February already, which means there are less than 6 months to go before the start of the London 2012 Olympics. That's a significant milestone because at LensesForHire we accept bookings up to 6 months in advance, if you're hiring for a week or longer. So the big question is, what kind of camera equipment will you be allowed to take into an Olympics venue? It's been a bit confusing. LOCOG's official ticketing conditions have about 7,000 words of dense legalese setting out what you must and may not do, and if you wade through them you'll find that the prohibited items include "large photographic equipment (including tripods)" (Clause 19.2.3) and the prohibited behaviours include "flash photography" (Clause 19.3.2). But it doesn't define "large". Back in March/April 2011 Amateur Photographer generated some controversy when it reported that even some compact cameras might be banned. That prompted LOCOG to rush out a policy statement saying that DSLRs and high-zoom compact cameras would be allowed. But there's still been no official definition of "large" photographic equipment. Until now. Last night I went to see Andy Hooper, chief sports photographer at the Daily Mail, talk at an event organised by Maidenhead Camera Club and the Sport In Focus 2012 project. His talk was called "Capture The Moment". 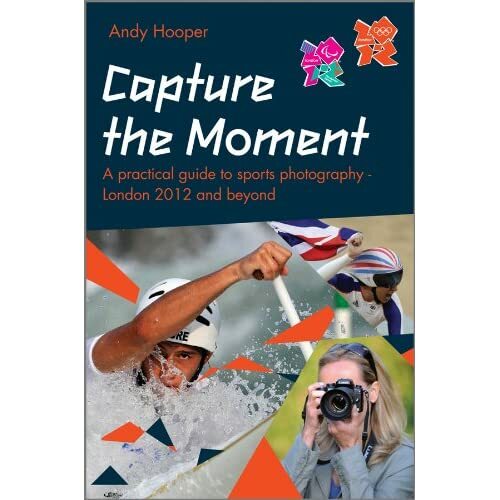 That's also the title of his book, which is a practical guide to sports photography at the London Olympics. You are allowed to take camera phones, compact cameras and DSLRs into Olympic and Paralympic venues as long as the equipment fits into a bag no bigger than 30 x 20 x 20cm. .... Tripods and flash photography are not permitted within the venues. Wow. 30 x 20 x 20cm? That's surprisingly big. Coincidentally, 30 x 20 x 20cm is one of the standard box sizes we use at LensesForHire. We're going to have some fun over the next couple of days working out how much we can pack into one. Personally, if I were planning to take a telephoto lens into an Olympic venue, I'd make sure I had a copy of Andy Hooper's book with me, open to page 278. It's actually a very good book for anyone who's interested in photographing sports, and it's available for £14.99 from the LOCOG shop or somewhat cheaper from Amazon.